Totana.net - Martínez Usero: "if we have to make a second economic and financial plan Totana is because the former has failed"
Martínez Usero: "if we have to make a second economic and financial plan Totana is because the former has failed"
"For once and for all we know what the real economic situation of the municipality"
Usero Martinez said in a statement that "the PSOE is in the working groups for the second Economic and Financial Plan of this term as announced at the extraordinary plenary session of May." The socialist also warns that "their contributions have to be taken into account as they are not going to be a guest at a stone panels where we discuss something as important to the residents of Totana. Recalls that the full council in May, they approved these workshops "was an initiative of the PSOE in with dozens of proposals that were rejected by the majority of the PP." 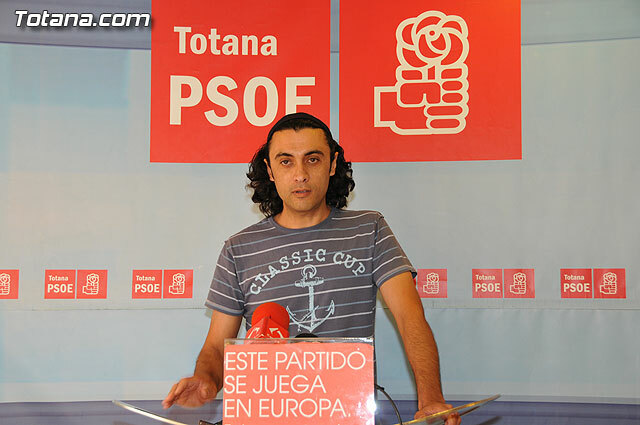 Alderman says that in recent months, the PSOE has put on the table over sixty initiatives in two plenary sessions and special economic measures for the unemployed in some cases were denounced as illegal by the PP, and then the government itself Popular Party has plagiarized these socialist initiatives to bring about change the name. " The council concludes that "even with this background will pitch in to make the town a difficult situation."